ELMIRA, N.Y. — Coming off the previous weekend’s sweep of King’s College, the Chatham women’s hockey team hit the road again over the weekend, taking on the No. 1 Elmira Soaring Eagles. Unfortunately, it was the Cougars that got swept as they lost 6-0 on Friday and 7-0 on Saturday. In game one, Elmira started fast, scoring just 1:48 in the opening period when Shannon Strawinski got one past Junior netminder Devon Strachan. Following that goal, Strachan settled down and held Elmira at bay, saving 18 of 19 shots through the first period. Elmira got another early goal just five minutes into the second to take a 2-0 lead. The Soaring Eagles continued to dominate throughout the period, living in the Chatham zone and throwing everything they could at Strachan, who continued to stand on her head. Elmira struck again on the powerplay with just over four minutes to play in the period to increase their lead to 3-0. Strachan was excellent as she made 22 saves in the second period alone. At the other end, the Cougars only mustered a single shot in the period, giving them a total of two shots through two periods. In the third, Elmira once again struck gold early as Maddy Jerolman got her second straight goal just 5:48 in and the Eagles added another just six seconds later, to make the deficit 5-0. Strachan continued to make saves for the Cougars, but Elmira snuck one more past her on a goal from game as Ariella Haas with 5:51 left to seal the deal for the 6-0 final. Strachan made another 22 saves in the 3rd period. With 62 saves on 68 shots, Strachan continued her stellar play and once more made a case for herself as one of the top goalies in the UCHC conference, despite the lack of offensive support from her teammates over the weekend. In game two, the Cougars once again turned to Strachan, who started strong. She held Elmira scoreless past the midway point of the first. But the Eagles finally broke through, scoring with 3:46 left in the period on a goal from Shannon Strawinski. Just two and a half minutes later, Maddy Jerolman scored her third goal of the weekend, making it 2-0 Elmira after one. In the second, Strachan once again started strong in holding Elmira at bay to the midway point. Things took a quick downturn as Elmira scored three goals in the final 10 minutes of the second from Eliza Beaudin, Katie Granato and Maddie Evangelous. Strachan again made a remarkable 22 saves in the period. The third period had the same script as the first two with a good start for the Cougars. Elmira could not get any past Strachan in the first half of the period. It stayed that way until the final three minutes, when the Eagles added two goals to their lead to secure the 7-0 victory and the weekend sweep of the Cougars. Elmira outshot the Cougars 46 to 9 on the weekend. Strachan made 101 saves in two games. For Elmira, senior captain Evangelous registered five points, eclipsing the 100-point milestone for her career. With the weekend sweep, Chatham dropped to 7-15 overall and 4-11 in conference. The No. 1 Elmira Soaring Eagles won their 11th and 12th games in a row, improving to 18-2-1 overall and 14-0 in conference. The Cougars return to the ice Wednesday, February 6 when they take on the Neumann Knights in a makeup game. Neumann comes into the game with a record of 5-15 overall and 4-9 in conference. Neumann beat Chatham on January 18, 3-0. Puck drop at Pittsburgh Ice Arena is 12:00 PM before the Cougars head into their bye weekend. 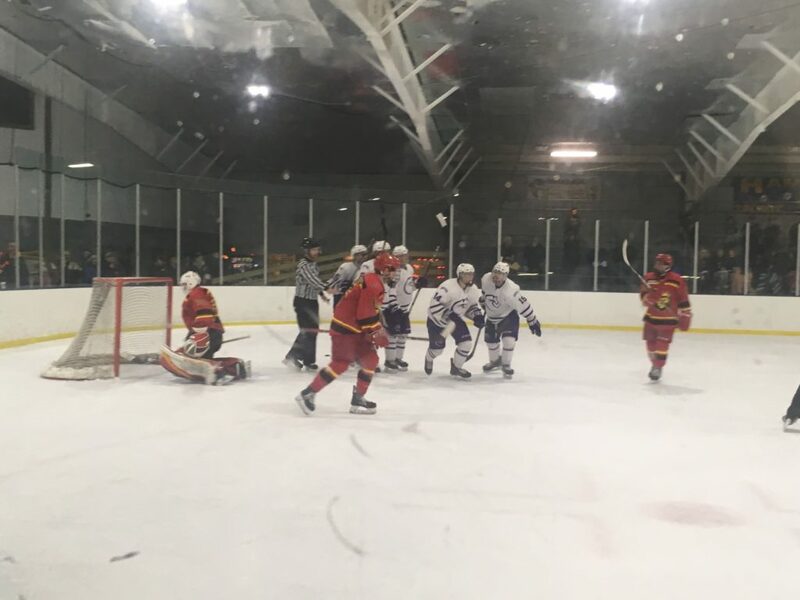 RYE, N.Y. — The Chatham men looked to avenge the 5-0 loss to the Manhattanville Valiants early in the 2018-19 season. The Cougars put up a better fight against the Valiants this time, but came out on the wrong end of a 6-4 score. Manhattanville dominated the start, but Chatham goaltender Ricardo Gonzalez was strong for the third straight game. As the period neared the halfway point, Chatham found themselves shorthanded after a charging minor on Senior John Ryan. Undeterred, the Cougars struck first with a shorthanded goal when Chad Bell found himself on a two-on-one, ripping a shot past Tyler Feaver to give Chatham the 1-0 lead. The lead lasted just 47 seconds as Manhattanville, still on the same powerplay, had a shot deflect off the skate of Braeden Cross and, following a mad scramble in front, sneak past Gonzalez, tying the game at one. The first period ended with the Cougars being outshot 16-4, but the score tied regardless. As the second period began, the Cougars got out to a roaring start as Michael Lamison, a Johnstown native, found himself all alone in the slot off a pass from Dan Bellafiore. Lamison ripped one high over the blocker on a perfectly placed shot and the Cougars regained their one goal lead. Once again, the lead did not last. Ten minutes later, off another mad scramble in front, Cross would jam home his second of the game, tying it up at two. Chatham was able to bounce back, getting another shorthanded goal from Lamison, who picked up his second of the game and seventh on the season. Like the earlier sequence, the Valiants responded, scoring on the same powerplay as Cory Anderson got the equalizer. For three times in the first two periods, the Cougars had a one goal lead only to see the Valiants tie the game, resulting a 3-3 tie after two periods. The third period began much differently than the first two when the Valiants’ Oscar Arfelt scored just 34 seconds in, blasting one from the right wing half wall and past Gonzalez, giving Manhattanville their first lead of the game. The Valiants would not stop there as Anderson picked up his second of the game just past the halfway point of the third, making it 5-3 Manhattanville. This time it was the Cougars turn to try and make a comeback. Just 23 seconds following Manhattanville’s goal, during 4-on-4 play, Kirk Underwood threaded the needle and threw a perfect pass back door to Andrew Breda who cut the Valiant’s lead to one. The Cougars comeback effort fell short as Manhattenville sealed the deal with an empty netter with 16 seconds left to secure the 6-4 win. Freshman Lamison had two goals for Chatham and Ricardo Gonzalez saved 38 out of the 43 shots he faced. ASTON, Pa. — If Chatham could not avenge an early-season loss to Manhattenville Friday night, they hoped to have better luck in a rematch with the Neumann Knights after battling to a 1-1 tie on January 13. Unfortunately for the Cougars, revenge was not to be had as they took a 7-1 loss Saturday. Chatham entered the game against a red-hot Neumann team that was 4-1-2 in their last seven games after starting 0-12-2. Chatham head coach Michael Callan turned to Sophomore Matt Calas between the pipes Saturday. In a game that was plentiful on power play opportunities on both sides, Chatham found themselves shorthanded just 1:59 into the game. Neumann wasted no time on the power play as Senior Joe Mitchell ripped the puck from the slot past the glove of Calas, making it 1-0 Knights. The Cougars held the Knights scoreless for most the remainder of the period, but Mitchell got his second of the game with just 1:38 remaining, giving Neumann a 2-0 lead after one. As the second period started, Neumann maintained momentum, scoring just 36 seconds in as Chris Caldwell snuck a backhander through the five-hole of Calas making it 3-0. The Knights continued to push but would not score until the 11:46 mark when they got another power play goal, this time off the stick of Barry Kneedler. The Knights added another just under four minutes later to increase the lead to five. In the late stages of the period, the Cougars had a chance to get back into the game. At the 16:54 mark, Clay Boyd of Neumann took a 5-minute major and game misconduct after launching Tristian Simm into the boards from behind. Chatham pressured the Knights and drew another penalty with 10 seconds left in the period to take a two-man advantage into the third period. Calas made 27 saves over the first two periods, but was replaced by Ricardo Gonzalez for the third. The Cougars started the period with 1:50 remaining on the two-man power play, but were unable to crack Mike Cosentino. The momentum from the penalty kill resulted in the Knights adding to their lead as Caldwell scored his second of the game at 5:32, making it 6-0. Chatham finally answered 15 seconds later as Manor native Clay Plyler put a wrist shot through the five-hole of Cosentino. Neumann was on a power play for almost all of the final 10 minutes of the third period. With 10:28 left in the game, Mitchell completed the hat trick on the 5-on-3 power play, which resulted in the 7-1 final. Overall, there were 17 penalties in the game with 11 going against Chatham. Ricardo Gonzalez made 14 saves in the third period, giving up two goals. Chatham dropped to 5-14-2 overall and 3-10-1 in conference. The Cougars will be back in action this weekend with games on Friday against the Utica Pioneers – a team they lost to 5-0 on December 1 – and on Saturday against Nazareth. The Golden Flyers beat Chatham 4-1 on November 30. Saturday will be Senior day for the Cougars as they will honor the teams two seniors, defensemen John Ryan, a Wake Forrest, North Carolina native, and Matthew Ho, of Vancouver, British Columbia. Puck drop for both games at Frozen Pond Arena will be at 7:10 PM.